I have recently acquired the Epsilon 2-band 27/50 [left] and the 27/55 [right]. They are both beautiful brushes. The 27/50, for some reason, took a significant breaking-in period. 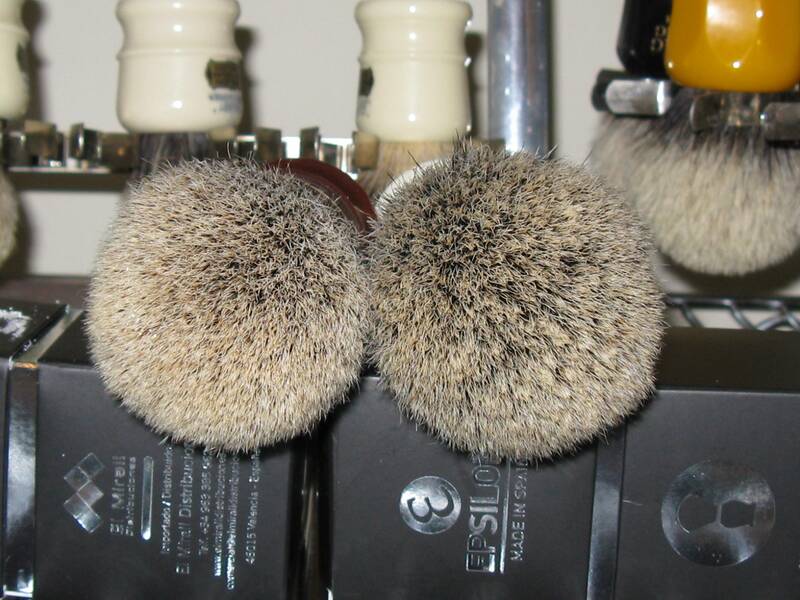 It stunk like no other brush I had, and would NOT generate a nice thick lather. After several shampoos, detergent washes and hand latherings it has finally come into its own. The 27/55 was much much less funkified and immediately whipped up a great lather, right out of the box. The backbone and density are well beyond the call of duty and when you consider there is no scritch at all I am dumbfounded how they found the hair used for these knots. The 27/55 may appear a bit less dense, however I think that it splays out, or blooms more than the 27/50. The latter appears in the picture exactly as it appeared out of the box - not enough splay to show any bloom. For the money, could be the best brushes out there. An excellent report, Ted. 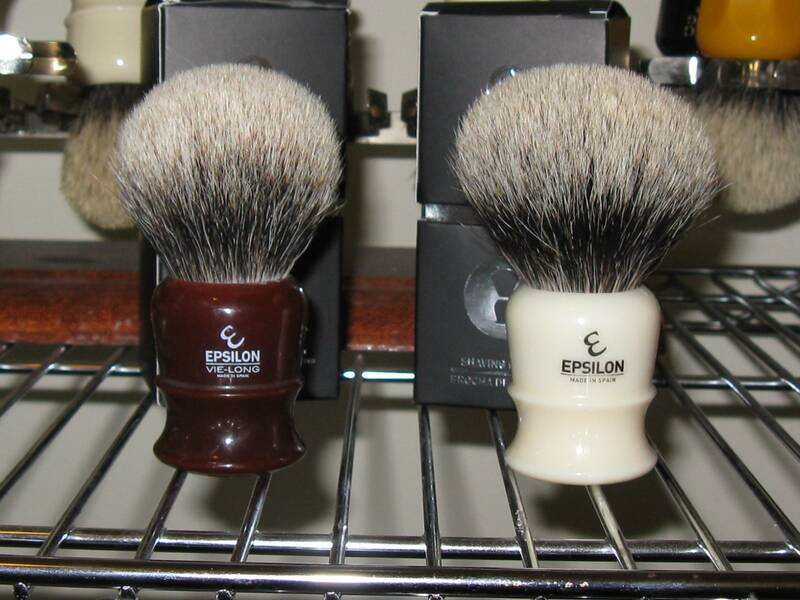 The Epsilon brushes represent superb value for money and are under appreciated, IMO. I had both 2-band lofts and as much as I love backbone, the 50mm was just excessive. And if you think these knots are great, may I suggest getting the 3-Band Silvertip in 50mm? It only gets better, and is one of my all time favourites. Congratulations, Ted and I would have to agree with you. Enjoy! (04-28-2016, 10:39 PM)celestino Wrote: Congratulations, Ted and I would have to agree with you. Enjoy! As Shakespeare would have said, "Oy vey, more choiceths!" Fantastic knots. Fantastically priced. Only let down is the handles. But for the price, what a fantastic brush !! The old handle seem to be turned and heavy duty quality. The new ones are lights and I'm not so sure they are actually turned, but more like pressed. Still as said FANTASTIC brushes for the price you pay ! (04-30-2016, 02:11 AM)steeleshaves Wrote: Where can you purchase these? I hear more and more good things about these brushes. My favorites knots, 100% natural and not chemically whitened, Can't wait to have several 2 Band Fan Shape.